A high opacity non phthalate white Plastisol ink with excellent covering power and smooth print-ability. This Plastisol ink range provides a smooth, flat, Matt finished print with high opacity. The Pyramid range of Plastisol inks have a nice creamy texture, yet retain excellent wet on wet screen print-ability. Our white Plastisol ink can be printed through mesh counts ranging from a 34T up to a 120T screen mesh. Pyramid Plastisol inks give excellent coverage with a consistent smooth ink transition through Screen mesh to garment. 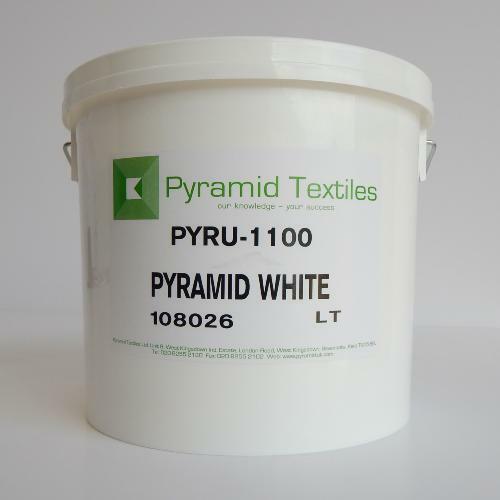 Pyramid white Plastisol ink is suitable for Cotton garments and also poly/cotton blends. Pyramid White can be cleaned from your Screen Mesh with one of our screen wash's from our Screen Cleaning Chemicals section. Available in 1LT and 5LT container size.